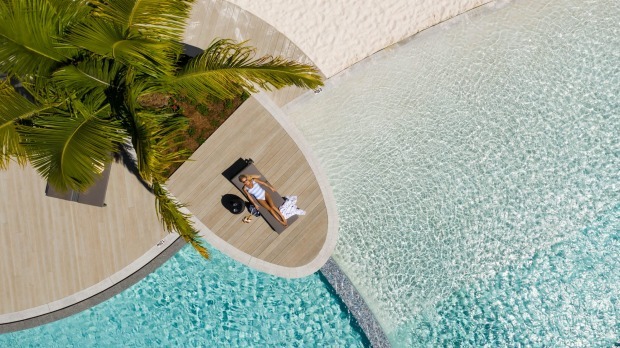 Gleaming white, except for the 1000-square metre pool area, which is turquoise by day and sapphire by night, the brand-new, 311-room Riley in Cairns is an imposing presence, both physically and as a likely game-changer. The Crystalbrook Collection property, funded by Dubai-based, Syrian entrepreneur Ghassan Aboud, opened in November to enthusiastic local fanfare. Riley is built on the old Rydges Tradewinds site on The Esplanade, which runs along much of the Cairns city waterfront. An expansive, convivial open-air lobby greets guests, like a big, friendly north Queenslander in an Akubra. From here you can see the beckoning lagoon pool, dotted with cabanas, sun lounges and palm trees. And beyond that is Eleme Day Spa and the property's architectural trophy piece, a distinctive 12-storey cylindrical glass tower, home to Riley's signature bar/restaurant, Rocco. All rooms and suites come with an Apple iPad Control Centre, free Wi-Fi, coffee pod machines and many complementary movies and/or video streaming on 55-inch HD TVs. All up, there are seven choices of rooms and suites, culminating in the two-bedroom, three-balcony, 85-square-metre Riley's Suite. Our sixth-floor Sea King room ($359 a night) is typical in that it overlooks the pool and out to the Coral Sea through the floor-to-ceiling windows and from the spacious balcony. The neutral palette is easy on the eye and the stylish kimono-inspired linen robe is easy on the rest of the body. Other thoughtful little tropical touches include snacks of dried mango, Territory Jerky, sriracha chilli and wild lime-flavoured chips and Blaq charcoal de-puffing eye masks. Riley's three bar/restaurants each offer eclectic choices in both food and beverage. Rocco, at the top of the tower and with excellent views of Cairns, is the hip new place to be seen. Dining is comprised of tapas plates to share and an impressive wine list, specialising in sparkling. The serves are huge, by city tapas standards. This is tropical north Queensland and, up here, they know how to eat. Clever menus light up when opened, enabling reviewers of a certain age to see the choices in the groovy, dim lighting. Rocco wouldn't look out of place in Surry Hills in Sydney or in a Melbourne laneway. Paper Crane operates as a breakfast buffet in the morning and an appealing hawker-style Asian fusion restaurant at lunch and in the evening, while the open-air Greenfields cafe's wide range of healthy options, regular tucker, cocktails and cold compress coffees, including a nitrogen-infused variant, keeps everyone happy. This is Cairns, gateway to the Great Barrier Reef, Daintree Rainforest, Atherton Tablelands; Port Douglas, Palm Cove and Kuranda. Enough said. And if you prefer your sea creatures land-based, Cairns Aquarium is a two-minute walk from the hotel. Generously proportioned, comfortable rooms with superb views, a huge pool area and interesting bars and restaurants makes Riley the new go-to accommodation in Cairns.